Chao Anouvong (1767-1829), or Chao Anou for short, was the last king of the former Lao kingdom of Lane Xang. He ruled from 1805 to 1828 in Vientiane and came to power after his brother’s death. Chao Anouvong had long been an ally of the Thai monarchs against Burmese invaders but unfortunately his accomplishments and support of the Thai kingdom was not well recognized. From 1826 to 1828 Chao Anouvong rebelled against Siam in an attempt to gain independence from Siam. 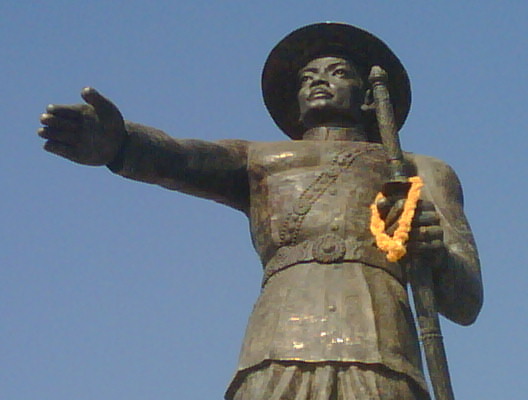 Chao Anouvong initially captured the Thai stronghold of Korat (Nakhon Ratchasima) with his army. He assumed that the local Lao people would follow and support him in his attempt to liberate the area inhabited mostly by Lao people (modern-day Isaan province). The support, however, was not as great as expected and Chao Anouvong had to withdraw his forces. Lady Mo, the deputy governor’s wife, is known for harassing the Lao invaders while they were withdrawing. Finally Chao Anouvong’s army was defeated in a three-day skirmish near Vientiane and the Siamese King Rama III ordered his troops to sack and occupy Vientiane. Chao Anouvong managed to escape and tried to return with Vietnamese help but was defeated once more by the Siamese troops and held captive whilst the Siamese King Rama III ordered Vientiane completely destroyed. Only one temple, Wat Sisaket, survived. The precious Buddha statues “Phra Bang” and “Phra Keo” were taken to Bangkok. Chao Anouvong died as prisoner in Bangkok. Vientiane recently opened a new park and monument on the Mekong River to celebrate the 450th anniversary of Vientiane as the capital of Laos and to honor Chao Anouvong. Interesting to be mentioned, that the statue of Chao Anouvong turns its back towards Laos and eyes once again over the Mekong River into Thailand, where more than 20 million former Lao, nowadays Thais, are living in Thailand’s Northeastern Isaan provinces!